Murphy Oil Corporation (Murphy) is exiting Malaysia with a US$2.13 billion sale of its two primary subsidiaries – Murphy Sabah Oil and Murphy Sarawak Oil – to Thailand’s PTT Exploration and Production Public Co. Ltd. (PTTEP), using the proceeds to pay down debt, buy back shares and fund potential deals back in the US. A unit of PTTEP will also pay Murphy up to a US$100 million bonus if certain exploration and drilling projects show results before October 2020. Malaysian-owned PETRONAS partners Murphy in Malaysia; the current deal between Murphy and PTTEP comes after increasing mergers and acquisitions (M&A) activity in Malaysia’s oil and gas sector, where global companies pursuing expansion plans are spotting opportunities. Murphy has proven reserves of 816 million barrels of oil equivalent (boe) in 2018, of which 129 million boe were from Malaysia – those assets produced over 48,000 boe per day for Murphy. In November 2018, Murphy was in talks to sell its Malaysian assets, with sources citing Spanish oil major Repsol, or other global majors as potential buyers for Murphy’s assets. The deal follows moves by other American oil majors to turn investment to high-yielding shale fields at home, where output has soared to more than 12 million barrels per day (bpd), rising over 2 million bpd since early 2018. Murphy, which also has operations in Canada, Brazil and other regions, said it will focus on the Western Hemisphere – mostly on the Eagle Ford basin in Texas and the US Gulf of Mexico – for future exploration and production deals.CEO Roger W. Jenkins has estimated to generate approximately US$1.2 billion of free cash flow at a flat US$55 West Texas Intermediate price. Last week, futures for light crude oil traded at around US$60 per barrel, and Murphy shares rose as much as 1.8% before closing at US$30.97, but PTTEP said the diversified deal is expected to promptly raise sales volumes by 15% and operate cash flow upon completion. Murphy also announced a US$500 million share buyback as well as debt reduction of about US$750 million. The company had about $US3 billion in debts as of December 2018. The deal on the Malaysian assets is expected to close by the end of the second quarter of 2019. 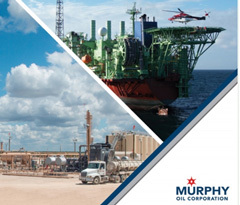 Murphy is global oil and natural gas exploration production company – their diverse resource base includes production from North America, offshore Gulf of Mexico and Canada.